Hannover wrote: Please be specific. What claim? What thread? Krema II was fumigated exactly once according to records, by the way. I want to know how it has more cyanide residue than the barracks if it has only been deloused once - or if it has been deloused more and this statistic from Mathis is wrong. It simply wouldn't be necessary to delouse the barracks as much if you delouse the people and clothing (the ones bringing in the infestation) first. The delousing of the barracks would be preventative more than eradication. It goes on with “The strange logic of Richard Green”. Astro3 is directly quoting Green but stills fails to address his point, which is that without demonstrating that Prussian Blue had to form in the homicidal gas-chambers, the absence of Prussian Blue is no evidence that no hydrogen cyanide was employed there. This argument is so simple and easy to follow, but also important - yet it seems not understood by astro3. I describe in detail in my expert report that brick, under normal circumstance, is not susceptible to any chemical reaction, as the sintering process has turned it physically and chemically inert to a rather high degree. The iron(III) in bricks is hence inactive. Only erosion and weathering over extended periods of time can activate the iron(III), as has happened on the outside of the two delousing buildings in Birkenau, which have been exposed for decades to the rather corrosive atmosphere of the upper Silesian industrial area to the point where some of them are actually disintegrating. It is mortar and plaster that has active iron(III), and my experiments have clearly shown an accumulation of a considerable percentage of the HCN used in the samples, stored as some non-volatile, at least midterm-stable compounds (probably to a considerable degree iron cyanides) after only one exposure to the gas. It's in my report. Why do I have to keep repeating myself? Dr. Green talks bull**** in hoping that nobody reads my expert report. His way of arguing is childish. Notice that the 'Holocaust Industry' spokesman, NickTerry, does not post to this thread. He believes in 'gas chambers' but dodges posting any proof. Why? He is, after all, registered here and could silence Revisionists IF he had proof. Talk about easy. Debunking the 'holocaust' is so easy. Germar Rudolf and I composed a proper science article and submitted it to a chemistry journal. We should behave as if normal science criteria could operate, I explained - even if it doesn't. I had sent him a draft article, which he quickly perfected. That could be the one science chemistry article in existence, which fully evaluates and critiques the three main chemical investigations: American, German and Polish. Its title was, ‘Differential Exposure of Brickwork to Hydrogen Cyanide During WW2’ and it has twelve pages, with 5 tables and 37 footnotes. It integrates the Leuchter and Rudolf investigations: these two both used a similar procedure, so it is appropriate to pool together their data-sources. Germar adopted a somewhat sceptical tone, that the accuracy and repeatability of the measurement process down at the c. 1 ppm level was hardly good enough for definitive conclusions to be drawn, and he suggested a basis for some further sampling of the walls. He hoped that that might help the article to gain acceptance. We sent it first to The Analyst, then to Chemistry – A European Journal, two Royal Society of Chemisry journals. Both rejected it, of course. The Analyst said it hadn’t got enough analysis in it! The latter didn’t bother to give a reason. And so it remains the case that no article anywhere in the English-speaking world has appeared on this topic, in any science journal. Well, you have tantalized us thoroughly. There's a million questions which come to mind, but seeing the work would be helpful. Will it be published at CODOH or Inconvenient History? And do forget about getting it published in establishment journals, they can't handle scientific "Holocaust" investigative work any more than the others. The academic process is now politicized beyond all hope. I hope we get to see it. Thanks. "Germar Rudolf and I composed a proper science article and submitted it to a chemistry journal. We should behave as if normal science criteria could operate, I explained - even if it doesn't"
The Rudolf Report: "Psychopathological and Dangerous"
The members of the Chemistry Department of the [French] Academy of Sciences received a few weeks ago a document entitled ‘The Rudolf Report,’ accompanied by an anonymous letter which explained the ongoing witch hunt against revisionist historians. Several days later, Le Monde informed us that the distribution and sale of this document is forbidden in France. The Rudolf Report’ combines scientific facts, which have no connection whatsoever to the subject, with a sick, feverish delusion that the gas chambers of Auschwitz could have only been used for killing lice on the clothes of deportees from Central Europe. We would not have paid much attention to this letter, had it not mentioned that the document had been sent to all professors of inorganic chemistry in German universities and had not received a single objection from any of them. Our silence could be interpreted as an approval. It is therefore important for us to state that this report is noteworthy only as an example of perversion of science: it is interesting to those in the field of psychopathology, but it is dangerous because of its professional appearance. The above declaration is astonishing. It is the collective opinion of the members, all the members, of the Chemistry Department of the French Academy of Sciences, who agreed to align themselves in this common declaration. The matter must be a serious one to inspire such solidarity. The opinion presented highlights the obvious in order to bring these items to our attention. These obvious matters are opposed by others, and this is the reason why this outlandish declaration is granted validity through its publication in a scientific magazine. There we have it. The authority of a scholarly magazine is used when publishing this unanimous declaration. One wonders, what could be so important that it justifies this collective initiative of academics and is handled in such a rush. What sort of document could precipitate such solidarity? The members of the Chemistry Department placed their collective authority into this declaration by requesting the reader to believe their words without proof. This is exactly the opposite of a scientific refutation: it replaces proof through argument with pure authority. No matter how great or how justified the authority of a scientist may be, he loses it in that instant when he falls back on his reputation instead of arguing to support his assessment. This Report, which is “only interesting to those in the field of the psychopathology,” is “quite dangerous because of its professional appearance.” How bizarre! A report, which was submitted to support a thesis and which displays solid psychopathology, would probably lead that thesis to its final ruin. Then how can the Rudolf Report be dangerous? Because it lends a professional appearance to the thesis which it defends. Does this Report therefore have a professional appearance? If this were the case, the Rudolf Report could not deceive anyone in the scientific world who would recognize its psychopathology right away, and its distribution within the field of the scientific public could only help convince them of the senselessness of revisionist arguments. This collective action of the French Academy (which sounds like a warning) seems to be exaggerated. If the data published in the Rudolf Report has no relation to the subject, and the subject is handled exactly as described by the members of the Chemistry Department, then it is not clear how it can yield a professional appearance. But, if the Rudolf Report is unprofessional and still appears to be professional, then any reasonable action that could eliminate this appearance would be desired. If the facts do not support the thesis, then the only reasonable and effective way would be to prove this. A simple prohibiting declaration appealing to authority is the worst of all possible quick responses. It is important to take steps to expose the deception by clearly indicating the errors, which show the document’s appearance to be deceiving. If this is not done, silence “can certainly [...] be interpreted,” because this declaration by the academics says a lot – or, perhaps, not enough. The terrible revisionists are correct in maintaining that the Rudolf Report met complete rejection and an insulted reaction from the nobility, but they were not provided with a single justified objection. The reason for this is evident, and is possibly the message the authors intended to give: The Rudolf Report is not even worth being subject to the slightest justified criticism. If it is dangerous, it first of all requires a thorough criticism, which should be very easy to do, since the Rudolf Report is supposed to contain such great errors. A criticism would also be necessary since its errors are allegedly only recognizable under great scrutiny. Is the refutation of the Rudolf Report difficult or easy? The story offered here makes no sense at all and only offers a new impossibility. Who are these terrible revisionists, who, under the greatest expense and greatest drudgery, sent to the most competent personalities of France such a poorly composed report, full of scientific facts unrelated to the subject, in order to reveal their trickery? This is, evidently, a complex strategy, which can be shattered immediately by breaking the silence – it is that simple. The members of the Chemistry Department of the French Academy of Sciences proved incapable of refuting the Rudolf Report: An Expert Report on Chemical and Technical Aspects of the ‘Gas Chambers’ of Auschwitz, or else they carelessly contributed their signatures without understanding the object of its research. They expose themselves to such a suspicion. Fortunately, we were informed by Le Monde that the distribution and sale of this Rudolf Report is forbidden in France. Therefore there are no more problems! Sleep ... sleep, you little ones ... sleep! Keep on walking, there is nothing to see! The Revisionist 2(4) (2004), pp. 440f. For the sake of clarity and usefulness to occasional visitors, can someone summarize the state of knowledge regarding the "Cyanide Chemistry at Auschwitz". What is found in the facilities, ruins or archaeological? What conclusions can be drawn from this? "For the sake of clarity and usefulness to occasional visitors, can someone summarize the state of knowledge regarding the "Cyanide Chemistry at Auschwitz". What is found in the facilities, ruins or archaeological? What conclusions can be drawn from this?" That's a good idea, Hektor.....why don't you get right on it? Make it one of your New Years resolutions. The Warden wrote: Of course, with the amount of mattresses, there would be staining on the side of every building in the camp, even if it was possible to control the direction of the gas outside. And who would think to move the people out of the areas with the mattresses and delouse those rooms with the mattresses in place, right? If the Believer stories are accurate, this process could've been miraculously done and ventilated while the residents were out taking a 5 minute stroll around camp! The desperate nature of this mattress claim is more evident than ever. God forbid any Believer see a brick with blue staining on the inside, then the same blue staining on the outside, and understand the brick would be blue throughout. Perhaps a foundation and museum be set up for the genocide of WWII mattresses? My request is a bit off topic so apologies in advance but I'm in need of some expertise from other members. I've been 'showing the revisionist flag' at some believer sites and was given an answer to a question and I can't determine whether it's possible or not. I had asked what had been done with the leftover Zyklon-B when it was removed from the Kula columns in the Auschwitz gas chambers. I was told that, due to it's distance to other buildings it was simply dumped at the "southern end" of the gas chambers and the cyanide simply dispersed. Sounded a bit iffy but is that a realistic means of disposing of outgassing Zyklon-B? Atigun wrote: I had asked what had been done with the leftover Zyklon-B when it was removed from the Kula columns in the Auschwitz gas chambers. I was told that, due to it's distance to other buildings it was simply dumped at the "southern end" of the gas chambers and the cyanide simply dispersed. Sounded a bit iffy but is that a realistic means of disposing of outgassing Zyklon-B? 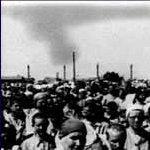 The two main 'gas chambers at Auschwitz / Birkenau were exactly the same, supposedly in Kremas II & III. So let's play along with the storyline. Up to 2000 Jews were supposedly gassed until dead, then they were supposedly taken via an elevator to the crematorium directly above. Fact: as seen in the plans, this elevator is hand drawn, and is only 4 ft X 9 ft. How in the world could 2000 Jews have been loaded onto a 4 ft x 9 ft. hand drawn elevator in just a few minutes? Remember, the storyline says that the gassings and resultant cremations were non-stop for much of the period in question. We supposedly have another batch of 2000 Jews waiting outside, supposedly being tricked into thinking they were about to receive showers. It would have been impossible to disentangle all the supposedly dead Jews and load 2000 of them onto to this postage stamp of an elevator, hoist them by hand up to the crematory 'ovens' in just minutes. And this repeated process meant that the crematory ovens above would not have been capable of cremating them in the time alleged, which meant a build-up, an enormous backlog would have occurred. The storyline even states that the backlog of the to-be-cremated-gassed-Jews required stacking them outside. Once again, the alleged 2000 Jews were outside in full view of this laughable backlog claim, but supposedly they still thought they were getting 'showers'. Of course, timely aerial reconnaissance photos show nothing of the kind. Furthermore, while the Jews were waiting outside, the storyline says that a SS man with a gas mask climbed upon the roof of the Kremas (only maybe 18 inches, or close to it, above the ground, Kremas II & III were largely underground) and dropped Zyklon-B granules into a container and lowered it down into the 'holes' in the roof, into the morgues which were supposedly converted into a gas chamber. The waiting 2000 Jews would have a clear view of the man on the roof's activity, yet these 2000 Jews were supposedly not concerned and still thought they were going to get innocent showers. The storyline is utterly ridiculous. Yes, the storyline also says that vents were used to remove the gas, but then we are still in a situation where the entire area is vulnerable to cyanide gas once vented. The vents that did exist were at the bottom of the crematorium which would have been blocked by all the allegedly dead Jews piled atop each other. Not to mention that this alleged cyanide gas venting process certainly would have been noticed by the alleged waiting 2000 Jews. And where does this SS man in a gas mask put the outgassing Zyklon-B pesticide granules which he has supposedly withdrawn, which would be releasing cyanide for hours? The entire, bizarre story is unsustainable with even the slightest scrutiny. It's no wonder why Jewish supremacists trot out senile, lying 'survivors' (who wouldn't have even survived if the tall tales were true) for emotional impact. No wonder that there are Thought Crime laws against examining this absurd process. 'House of cards' is an understatement. The 'holocaust' storyline is one of the most easily debunked narratives ever contrived. That is why those who question it are arrested and persecuted. That is why violent racist Jewish supremacists demand that there be no open debate. Indeed, Hannover the Auschwitz gassing narrative is absurd. However, I need to address the barefaced assertion that outgassing Zyklon-B can be safely dumped in the open if there is 20 or more meters of distance to other buildings or personnel. The claim being that the cyanide concentration would be to low to affect anyone. I know, sounds idiotic but what would be a proper response other than, "Sounds like BS to me." Remember, the alleged batch-after-batch of waiting Jews were outside right next to the alleged 'gas chambers' door. Please read my previous post again. You might just copy & paste that post. There are just too many points for them to try and spin. Or challenge them to post at this forum, they have no chance with our level playing field. This devastating and hilarious video by Vincent Reynouard with subtitles by Kladderadatsch, simply has to be a part of this thread on Cyanide Chemistry. Steve F wrote: This devastating and hilarious video by Vincent Reynouard with subtitles by Kladderadatsch, simply has to be a part of this thread on Cyanide Chemistry. The California Cyanide Company of Los Angeles, California, was the only distributor of liquid cyanide in the western United States and refused to deliver it to Carson City over liability concerns. The poison was used to eradicate pests from citrus groves in California. Warden Denver S. Dickerson sent his assistant Tom Pickett to Los Angeles to personally pick up 20 pounds of lethal gas, which was contained in a mobile fumigating unit that cost $700. Four guards who did not want to participate in the process had resigned. The officials first attempted to pump poison gas directly into Gee's cell while he was sleeping, but without success because the gas leaked from the cell. A makeshift gas chamber was set up at the butcher shop of the prison. At least one cat was used to test the lethal effectiveness of the chamber. Gee was to be strapped onto a chair in the chamber, which was eleven feet long, ten feet wide, and eight feet high. A small window next to the wooden chair allowed witnesses to look inside. Attendees included news reporters, public health officials, and representatives of the U.S. Army. Gee wept as he was placed on the chair until the captain of the guards told him to "Brace up!" At 9:40 a.m. on February 8, 1924, the pump sprayed four pounds of hydrocyanic acid into the chamber. The weather was cold and humid. Because an electric heater failed, the chamber was 52 degrees Fahrenheit instead of the ideal 75 degrees, causing some of the acid to form a puddle on the floor. Gee appeared to lose consciousness in about five seconds, with his head continuing to nod up and down for six minutes. He was completely motionless after ten minutes. Some of the witnesses momentarily thought they smelled the odor of almond blossoms, a telltale sign of cyanide, leaking from the chamber. The warden had the witnesses cleared from the area. At about 10 a.m., a vent was opened and a fan was turned on to discharge the poison gas. The prison staff waited for the remaining puddle of hydrocyanic acid to evaporate before cleaning up the chamber. Gee's body was removed from the chamber at 12:20 p.m. and taken to the prison hospital. A group of seven doctors pronounced him dead, but did not conduct an autopsy on the body out of concern that some remaining gas could be released. Gee was 29 years old when he died. Note the fumigator in front of the chair. The first person to die in Nevada's new gas chamber was Chinese born Gee Jon, on February 8th, 1924, for the murder of Tom Quong Kee, a member of a rival gang. His lawyers had fought a long battle in the courts to show that gassing was "cruel and unusual punishment" and as such was illegal under the 8th Amendment to the American Constitution. This execution did not take place in a conventional gas chamber, but rather in an overly large room in a building in the prison grounds that had previously been the barber shop. The gas was produced by vaporizing hydrocyanic acid using a mobile fumigating sprayer manufactured by the California Cyanide Company. Click here to see a photo of the room and sprayer. The execution commenced at 9.30 a.m. when Gee Jon was led from a holding cell and secured to one of the two rough wooden chairs within the room. In the cold February temperatures the hydrocyanic acid was reluctant to vaporize and so it took some time for the concentration of gas to reach a lethal level. Jon appeared to struggle a little after the gas was pumped in and then lapse into unconsciousness, but as no external stethoscope had been provided, he was left in the chamber for 30 minutes to ensure death. The Nevada State Journal ran a banner headline the following morning, stating “Nevada Gas Death Law Held Success.” Later a conventional gas chamber was constructed. Most of America's gas chambers were built in the 1930's by Eaton Metal Products who had factories in Salt Lake City, Utah, Denver, Colorado; and Casper, Wyoming. They are of welded and riveted steel construction, including the floor. There is an adjoining Chemical Room where the chemicals are mixed prior to use and a Control Room. Some chambers were built with a single chair as in Colorado, Mississippi, Oregon and Wyoming and some with two chairs as in Arizona, California and Missouri (the latter was not constructed by Eaton). Both types were of otherwise similar pattern. To prevent the cyanide gas condensing the execution area has to be kept heat to at least 80 degrees F and any electrical fittings, e.g. lights have to be explosion proof, as hydrogen cyanide gas is explosive. So there is some special equipment required to make the HCN work in the desired way.